Endometriosis (pronounced end-oh-me-tree-oh-sis) effects millions of women world wide, and I'm one of them. Endometriosis is a painful, progressive disorder of the female reproductive system which causes damage in the pelvic cavity. It can at times cause debilitating pain and is a common reason for infertility. The staggering lack of awareness means many women put up with their symptoms believing them to be "normal" and suffer years before seeking the right treatment. Most women experience years of pain and in some cases are led to believe that their pain is all in their head or they are "just depressed", due to the dismissive ignorance of some doctors in the medical profession. During the three years before my diagnosis I believed that my pain was just a "normal" part of being a woman. Countless ultrasounds, blood tests and scans continually came back clear. Month after month along with each period, the pain worsened to the extent that I experienced pain everyday which radiated to my lower back also. It wasn't until it got to the point when the pain became almost unbearable and I started getting bladder pain and infections that I realised the doctors were wrong, that my pain wasn't the norm. It took years until I knew that I had to make the choice to undergo a diagnostic laparoscopy (surgery) to identify the cause of the pain. In all those years of uncertainty, never was I once informed that the disease doesn't show up on scans and that the only formal way of diagnosing it is through a diagnostic laparoscopy. All those years I felt like a total nut case, and sadly, this is an all too common experience for most women living with the disease and this is exactly the reason why I wish to write about my experiences with the disease, and my journey to diagnosis- because it shouldn't be this way. As a result of this disease, I suffer from adhesions (which means that my bladder is attached to my left ovary by a wall of scar tissue formation), bowel and bladder symptoms which cause both pain, frustration and extreme fatigue. Although there are several methods of treatment which may alleviate some of the pain and symptoms associated with the disease, I find myself in a constant battle with pain, horrid hormonal treatments (which render me a basket case), and one surgical procedure after another; with only minimal short term relief. In the five years that I have been living with the disease, I've had to come to terms with facing a chronic and often painful disease for which there is yet no current cure for. 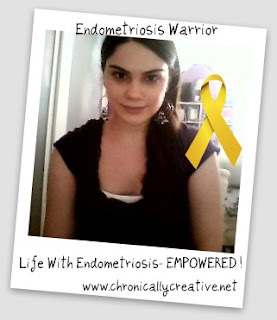 By writing about and sharing my experiences of the ups and downs of living and dealing with Endometriosis, I hope to raise awareness and fight with the knowledge that I may have Endometriosis, but it sure as hell doesn't have me. If I have to live with Endometriosis, I am determined to live an extraordinary life, EMPOWERED! 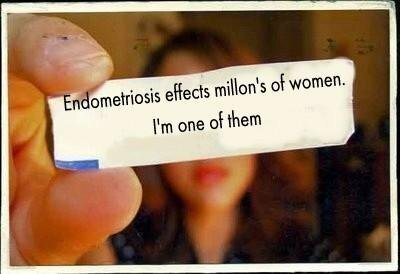 I didn't know I had endometriosis until I was having my ovaries removed. The OBGYN cut away at some of the worst adhesions, but I'd already been under for longer than planned (supposed to have been a laproscopic surgery, but the endo and the actual size of the cyst made that impossible. Added to the already existing adhesions and scar tissue were another 10 years of cycles. While I now I no longer take hormones, so no more cycles, I'm convinced that alot of my digestive issues, including cramping, is the result of these adhesions. I had all the symptoms of endo, but the few times I mentioned these, the dr. never suggested that was the problem! I hope that with folks like you coming forward and giving the issue a voice and a face, maybe the medical system will recognize the "realness" of this invisible illness. I am on the same path with the same goal! Glad to have found your blog! We need more information, more dialogue and far more open mindedness by doctors to help those of us who suffer with this day in and day out. I hope to connect with you on Twitter (@EndoJourney) and learn from each other and support each other through this! phylor- That's horrible, sorry to hear about your experience, endo can be so horrendous. I am really looking forward to the day they find a cure. woman warrior- awesome! Thanks for stopping by. Would love to follow you on twitter, I don't think you are following me you're not on my list. The designer of my blog template has stupidly linked his twitter account, so maybe you are following his instead? I'll have to make my twitter account more clear. I'm @chroniccreativ. I'll come find you!